Posted in Young Creative Entrepreneur and tagged Albertay University, Anup Tapadia, Assyria games, British Council, British Council India, Cambridge, China, Columbia, computer video games, Creative Economy, creative industry, Digital City, Digital Goldfish, digital media, Dr.Simon, Dundee, Edinburgh, Hitman, Ian Livingston, Iguana, India, interactive entertainment, International Young Creative Interactive Entrepreneur, iPhone games, IShift, IYCE, London, Mediatonic, Mexico, Middlesbrough, Moving Brands, Paul Croft, PlayGen, Poland, RGA, Tag games, Teeside University, Tomb Raider, TouchMagix, Trampoline Systems, Twisted, UK, UKIE, Unit9, University of Edinburgh, Wired UK, yce on April 21, 2011 by British Council India. Recently I was fortunate to be a part of the YCE awards arranged by British Council and was also lucky to be the winner of “International Young Creative Interactive Entrepreneur 2010” award in London. I feel along with the award, it was the journey that was quite exciting and here is a summary of my experience and thoughts of the tour. On winning the national YCE awards, 12 winners from different countries like Poland, Columbia, China, India, Mexico and many more assembled in London to compete for the International YCE award and go on a 10 day creative industry road-trip in UK. This full trip was sponsored by British Council to promote cross border collaborations in creative economy. On arriving in London on 13th, our first meeting was with Ian Livingston, who is regarded as founding fathers of interactive entertainment in UK. His company is well known for creation of game characters like “Tomb Raider” and “Hitman”. 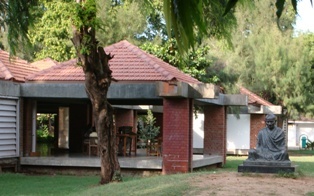 The key learning was how he took his hobby of traditional games to modern computer video games to create a successful venture. We also met the UKIE, the trade body for UK’s interactive entertainment industry on the same day. After our presentation day, we had a some free time to explore London and places around. I also found some time to visit our customers in Cambridge and a few more companies who were intending to do business with TouchMagix in London. On 17th, some of us took an early train to Edinburgh so that we could explore the beautiful city. I met with Shadab, a friend of mine who was studying at University of Edinburgh. He showed me around the university and we were discussing the similarities and dissimilarities between the UK and Indian education systems. On 18th morning we headed out on a road trip to Albertay University in Dundee. I was quite amazed to see a college who was training talent for the interactive and gaming industry. This kind of education is unheard of in India. We visited their game development studios and got an overview of the type of courses that were being offered there. We met with some interesting companies in the area like Digital Goldfish, a start-up who develops iPhone games and Tag games which was a big company developing mobile and online games. After quite a busy day, we headed back to Edinburgh to catch a train to Middlesbrough. On 19th morning, we visited the Teeside University, which was one of the highlights of the trip. Dr.Simon, the dean of School of Computing was kind enough to give us a tour of the university and the various activities that were happening out there. We met with some students who were part of an entrepreneurial fellowship program conducted by the university. This program was conducted to encourage creation of start-ups in interactive media space. We then visited a cluster called Digital City, which was a hub for many start-ups in interactive media. We met with founder of Assyria games, Twisted and Iguana who were based in the cluster. After returning to London on 20th, we visited several digital agencies like RGA, Unit9, PlayGen, IShift, Trampoline Systems, Moving Brands to name a few. It was very interesting to way these companies were working to serve different niche needs of the growing interactive creative economy. There were wide range of target customers these companies were serving. PlayGen was a company who was specialized in making serious games especially for the government sector where as Moving Brands was a company who were helping brands connect with people through interactive media and fun. On 22nd we visited Wired UK the popular magazine which showcases latest innovations. We also met with Paul Croft from Mediatonic who design online games and work with large publishers to tailor and distribute their IP. The day ended with a networking event of people from digital media industry. Made some new friends there and also got a change to present our companies in brief. Interactive industry is evolving as a modern story telling mechanism. Forming small and efficient teams is the way to start a business in game development. Creating your own IP or riding on someone else’s IP is an important part of being in creative business. Talent hunt problem is common everywhere. Universities like Albertay and Teeside are helping reduce those by imparting right training. Interactive industry clusters are a neat way to create good companies who contribute towards creative economy. UK market is a growing market for creative companies to work with. Posted in Young Creative Entrepreneur and tagged Angel Gambino, Anup Tapadia, Argentina, BAFTA, Bebo, British Council, British Council India, China, Colombia, Communications, Deborah Dignam, Design, Estonia, Fashion, India, Indonesia, Intel, interactive media, Latvia, Lebanon, London TouchMagix, Mexico, MTV, Music, Nike, Nokia, Paul Croft, Performing Arts, Poland, Publishing, Reebok, Russia, Screen, Slovakia, Slovenia, Syria, Turkey, UAE and Vietnam, Visual Arts, Young Interactive Entrepreneur on October 27, 2010 by British Council India. The Indian YCE Interactive winner, Anup Tapadia competed against the brightest and best young talents working in the business of interactive media in emerging markets around the world to win British Council’s International Young Interactive Entrepreneur Award. Chosen from a short-list of 25-35 year-olds from Argentina, China, Colombia, Estonia, India, Indonesia, Latvia, Lebanon, Mexico, Poland, Russia, Slovakia, Slovenia, Syria, Turkey, UAE and Vietnam, Anup received his award at a ceremony at BAFTA in London on 20 October. Anup was announced the winner of India YCE Interactive on 1 September at a gala awards ceremony along with winners of six other sectors. He has been in the UK for a programme of meetings in London, Bristol, Cardiff, Dundee and Middlesbrough to build the understanding of, and make contacts with the interactive industry. He will receive support from the British Council to develop subsequent projects linking their countries and the UK. The awards are part of the British Council’s wider Young Creative Entrepreneur (YCE) programme, which includes awards for entrepreneurs in the fields of publishing, music, performing arts, design, screen, visual arts, interactive media, fashion and communications. 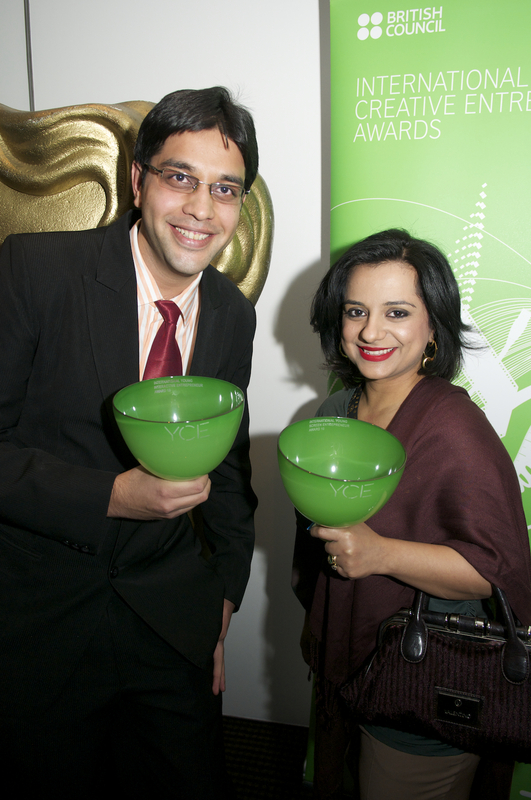 Anup Tapadia with Nayla Al Khaja, International Young Screen Entrepreneur winner at the Award Ceremony at BAFTA.